Here's a big piece of Corvette history, a 1968 Corvette Stingray Coupe with a numbers matching 427 big block and the imfamous Muncie M-20 4 speed with the all original shifter assembly. The body has never been hit or patched and all panels fit perfectly. The original chrome bumpers are newly rechromed and perfect. The all original black interior is unrestored.Lots of new or updated suspension components, and brakes are stainless steel upgrades. The 427 rat motor is numbers matching and originally a 390 horse, although the motor revamp includes a 435 horse hydraulic cam shaft, 10.25 to 1 compression pistons, new 3 angle valve job, new clutch assembly, and the list goes on. Custom header/ sidepipes make this rocket look great and fly FAST !!! Posi rear end, am-fm radio (original ), leather, power windows, original Rally rims, chrome luggage rack, and much, much more. 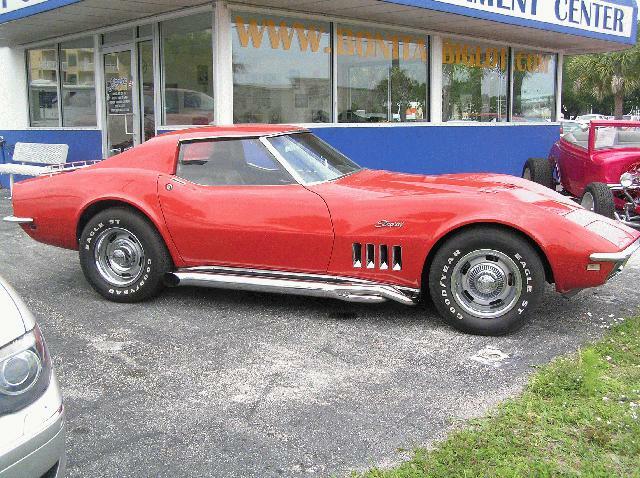 Call today to speak to our Corvette experts regarding this rare "big block" beauty.